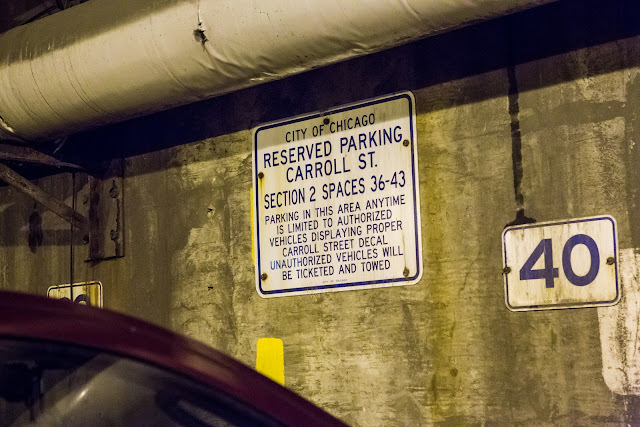 The Digital Research Library of Illinois History Journal™: Carroll Street, a little-known subterranean street which runs under some of the best-known buildings in Chicago's River North neighborhood. 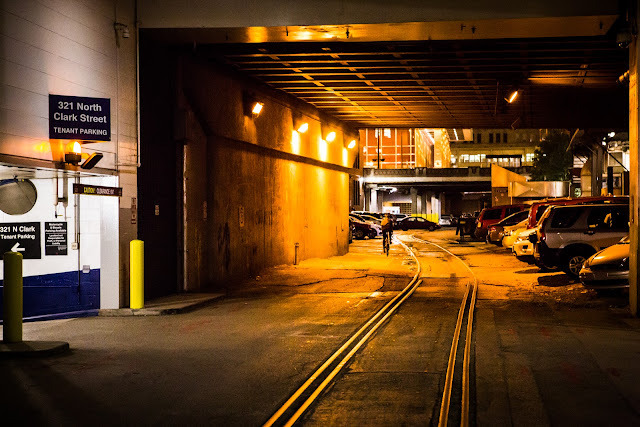 Carroll Street, a little-known subterranean street which runs under some of the best-known buildings in Chicago's River North neighborhood. At the mouth of the north branch of the Chicago River, the Kinzie Street Railroad Bridge stands as a relic of Chicago’s industrial past. It also marks the western end of Carroll Street, an old freight corridor that brought traffic to the bridge and yet remains, though largely forgotten and invisible in the modern cityscape. 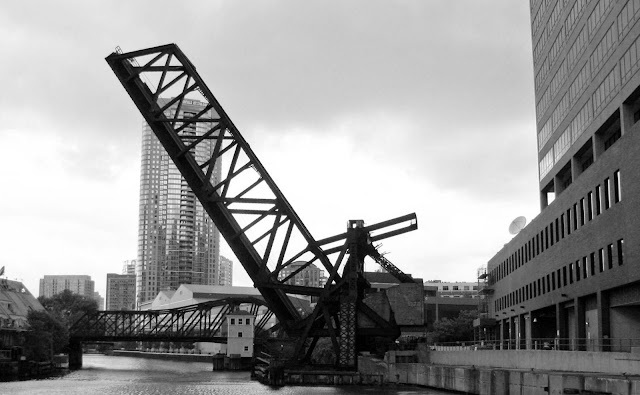 To understand the significance of Carroll Street, it helps to understand the history of the Kinzie Street Railroad Bridge. Located at a historically well-trafficked point of crossing, the current bridge was preceded by the first bridge ever built across the Chicago River (a pedestrian bridge built in 1832), the first railroad bridge built in Chicago (replacing the pedestrian bridge in 1852), and one of the first all steel railroad bridges in the United States (replacing the previous bridge in 1879). The current bridge replaced that bridge in 1908, and it was, at the time of its completion, the longest and heaviest bascule bridge in the world. The crossing point was important because it was the most obvious place to move people and goods from the north shore of the Chicago River to the train yards on the west side of the river’s forks. 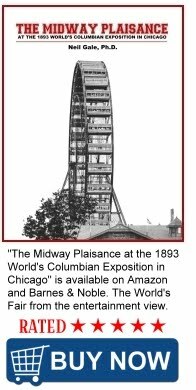 Although passenger train traffic ceased in 1911, the industrial activity in downtown Chicago ensured that this remained an important freight artery throughout most of the 20th century. The rail lines that extended from the Kinzie Street Railroad Bridge all the way to Navy Pier carried Baby Ruths and Butterfingers for the Curtiss Candy Company, newspapers for the Chicago Tribune and the Chicago Sun-Times, supplies for the Jardine Water Purification Plant on Lake Michigan (the largest capacity water filtration plant in the world), retail and wholesale goods to the Merchandise Mart (the largest building in the world when it opened in 1930), and any other freight that was part of the busy economic life of the area. All that remains of this once-important freight line is Carroll Street. As industry moved out of the area in the late 20th century, train traffic dried up until, in the 1990s, only the Sun-Times still used the rails, sending one newspaper-laden train per day from their downtown printing plant. When that facility was moved in 2000, the Kinzie Street Railroad Bridge was raised and the train tracks that run down the middle of Carroll Street have lain disused ever since. Carroll Street, though, does not go unused. 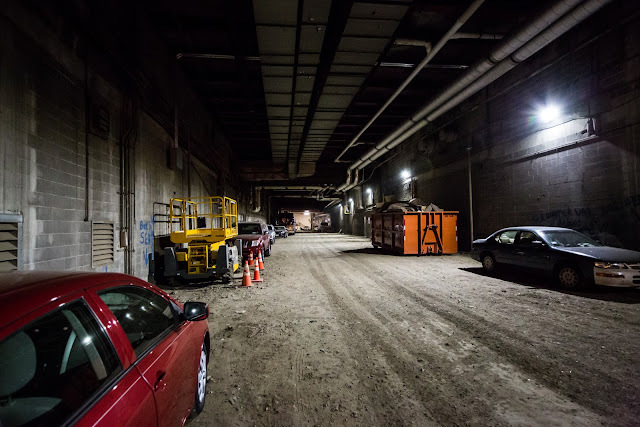 While multiple sections of the street are blocked off to regular traffic, the large basement loading docks that once flanked the rail lines have been converted to parking lots and the street is frequently used for deliveries, garbage pickup, and contractor access for the buildings above. Musicians performing at the House of Blues find that Carroll Street provides conveniently inconspicuous access to the venue. And the Kinzie Street Railroad Bridge — designated a Chicago Landmark in 2007 — is still owned by Union Pacific, who lower it and drive a pickup truck across it once per year to maintain their right of way. Suggestions to turn the street into a public transit corridor have yet to bear fruit. My dad worked for the Chicago Sun-Times, and took us on a tour where we saw the 'special secret' train.